Sometimes, you also want a heat shield that will look just as good as the rest of your vehicle! Cold-Gold Tape from Heatshield Products was specially designed to shield radiant heat, as well as look like the kind of show-quality material you see on a car in a prestigious competition, such as the Detroit Autorama Ridler award! Most �gold� thermal-barrier products on the market use �birthday balloon technology� to deflect heat. Mylar can look fantastic but it is the same material used in birthday balloons. Yes it can reflect heat away, but so will aluminum foil at a fraction of the cost. 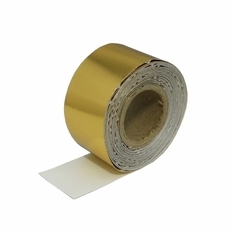 Heatshield Products Cold-Gold Tape is made from exclusive TruGold thermal-barrier material. Cold-Gold Tape is comprised of a true gold color reflective layer combined with a lightweight high grade fiberglass cloth. The full fiberglass back (not scrim) can protect components in those critical seconds between the start of a fire event and full-flame catastrophe. The fiberglass cloth backing acts as a fire barrier even after the gold coating burns off. Giving Cold-Gold Tape another advantage of the plethora of balloon based barriers. Cold-Gold Tape won�t degrade after long-term heat exposure. It can take constant ambient temps of up to 1,100 degrees Fahrenheit, intermittent ambient temps of 2,000 degrees Fahrenheit and direct-contact heat of up to 500 degrees Fahrenheit. Cold-Gold Tape can shield over 90 percent of radiant heat with a 1 inch space from the heat source.